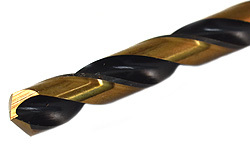 Our "Kill-Force" Black and Gold Drill Bits are extremely tough, one of the hardest drills to break. These bits won't slip or "spin", in worn or old chucks, are perfect for keyless chucks on cordless drills, and sizes are marked above the flats so they never get "spun off" or get hard to read. .0625 Decimal Equivalent. Flute Length = 7/8" OAL = 1-7/8" SOLD BY THE PIECE OR PACKAGE. .125 Decimal Equivalent. Flute Length = 1 5/8" OAL = 2 3/4" SOLD BY THE PIECE OR PACKAGE. .1719 Decimal Equivalent. Flute Length = 2 1/8" OAL = 3 1/4" SOLD BY THE PIECE OR PACKAGE. .2500 Decimal Equivalent. Flute Length = 2 3/4" OAL = 4" SOLD BY THE PIECE OR PACKAGE. .3438 Decimal Equivalent. Flute Length = 3 7/16" OAL = 4 3/4" SOLD BY THE PIECE OR PACKAGE. .4062 Decimal Equivalent. Flute Length = 3 7/8" OAL = 5 1/4" SOLD BY THE PIECE OR PACKAGE.